The trouble with this strategy, when it comes to the Aqva line at least, is that the perfumes don't smell “high-end.” Original Aqva Pour Homme has its moments, but it smells more like a blockbuster wannabe than an expensive niche creation. Then, Aqva Amara got my attention. Out of the blue came a musty, salty mineral note (accompanied by an ozonic/water accord). The mineral note intensified and caused the ozone to dissipate, and I was amazed that I started to smell like wet, funky marsh mud! The damp mud aroma gave way to more seaside notes…some smelling like driftwood, others like tar-smeared, water-soaked pilings. And almost as quickly as these unusual notes appeared and made me smile…they faded. Back came the water-ozone and some sanitized patchouli. The base of Aqva Amara (it lasts and lasts on skin) reminds me of a weaker version of John Varvatos Artisan…but made with neroli instead of orange blossom. If I were Bvlgari’s creative director of perfume, I would INSIST that its stash of ocean perfume notes (quite realistic and fun) be intensified and showcased in a fragrance. Why always make those cool, marine accords — smelling of seaweed, salt water, and dry, sun-bleached, salt-scoured woods — recede from smell? Frustrating. Aqva Amara has some flashes of interest, but it’s like a weekend rebel — a guy who shows his wild side only on Saturday night, or when no one he knows is looking. Aqva Amara should have left the normal stuff in the background and let the bold, crazy notes shine. 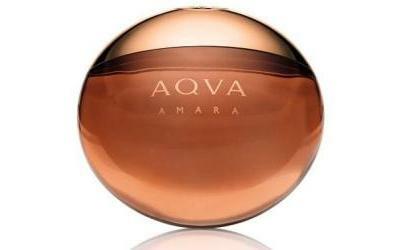 Bvlgari Aqva Amara Eau de Toilette is available in 50 and 100 ml ($70/90); shampoo/shower gel is $38. 1. Perfumer Jacques Cavallier; listed notes: mandarin, neroli, watery accord, patchouli and frankincense. 2. Women's Wear Daily, 1/10/2014. You want interesting notes to make you smile, you need another D.S. & Durga, Kevin! Noz: ha! Their latest ones produced a grimace! Oh, no, we don’t need that, either. Yes, this smells extremely diluted. Nothing worse than smelling like rubbing alcohol and water! I know it’s a Eau de Toilette but still very weak smelling. I’m sure it will have a couple of fans out there, maybe even a duck hunter or two. How disappointing! Wanted to really like this. Fully agree that the seaweedy, marine notes are tantalisingly distant in this one, which is a pity. For me, the overriding scent was of bitter oranges, which wasn’t too bad (I didn’t detect even half of the other notes you found in there: kudos to you, Kevin!). It’s better than the other Aqva scents, though, in the sense of being mildly more interesting. The flasks for all three Aqva fragrances drive me mad, though: maybe I’m just cack-handed, but they’re awkward to hold and spray, and have to laid down flat. Give me an ordinary stand-up cologne bottle any day!